Two Spanish scientists have designed an equation that provides a highly accurate estimate of an individual's speed based on stride length. They used data from professional athletes and walking and running experiments on a beach in order to come up with the equation. 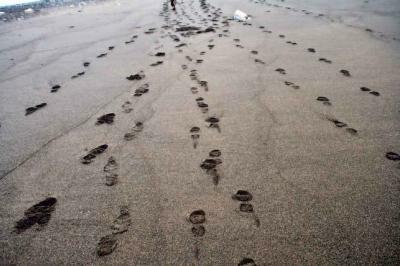 The result has applications in the study of fossil trackways of human footprints. In the spring of 2008, 14 palaeontology students from the Complutense University of Madrid ran along a beach in Asturias (Spain) at the request of a planetary geologist who was a friend of their fieldwork director. Javier Ruiz, from the Complutense University of Madrid (Spain), and his colleague Angélica Torices, from the University of Alberta (Canada), just out of curiosity, wanted to check how accurately an individual's speed could be calculated based on their tracks. The results, published in 2013 in the journal Ichnos, show that, without needing any other data such as leg length, they were able to achieve quite a high degree of accuracy, with a margin of error of 10 to 15%. "For humans, we are able to calculate speed based on stride length alone with a very good degree of accuracy," Javier Ruiz said. Ruiz and Torices measured the speed and stride length of the students as they ran along the beach and applied Alexander's equation. "The data fit with the equation very well," Ruiz explained, "Alexander did a good job with very little statistical data but with a large mathematical basis and we have seen empirically that his equation is correct."